Millions of people travel to New York City each year to experience culture, art and fashion. This spring, treat yourself to a Catholic fashion exhibit blending faith and fashion at the Metropolitan Museum of Art in New York City. 2018’s theme, Heavenly Bodies: Fashion and the Catholic Imagination, pays homage to Catholic symbols and influences on fashion. Open to the public May 10th – October 8th, the exhibit sets the tone for fashion trends and will attract crowds. “Heavenly Bodies” takes place in two locations: four galleries inside the Met’s Fifth Avenue location and the Met Cloisters at Fort Tryon Park. The Catholic fashion exhibit “Heavenly Bodies” kicks off with the lavish Met Gala on May 7th, 2018. The Met Gala is an annual invitation-only fundraiser taking place on the first Monday of May. The event benefits the New York’s Metropolitan Museum of Art’s Costume Institute. The “Super Bowl” of the fashion world, the evening boasts notable celebrities as guests who pay $30,000 per ticket. The 2018 Met Gala was hosted by Rihanna, Amal Clooney, Donatella Versace, Anna Wintour and Stephen and Christine Schwarzman. Honorary and co-chairs include Beyonce, Taylor Swift, Sarah Jessica Parker and Tom Brady. In keeping with annual tradition, celebrity guests reflect the theme through their evening attire. Playful reflections of the theme include Rihanna channeling the Pope and Sarah Jessica Parker wearing a nativity scene headpiece. Visions of innocence include Katy Perry in beautiful six foot tall angel wings and Kate Bosworth in a delicate veil. The Met’s “Heavenly Bodies” and Catholicism – Blasphemy or Opportunity? Did we mention celebrities dressed in religious-inspired garments for the Catholic fashion exhibit? Some may worry about celebrities pushing the envelope to reflect the theme. Some may be wary of having sacred items in a temporal setting at the exhibit. Others welcome “Heavenly Bodies” as an opportunity. It opens the discussion about Catholic traditions while in the spotlight in the middle of New York City. “Heavenly Bodies” exhibit curator, Andrew Bolton says, “It’s our hope the exhibition will promote an understanding of the symbiotic and sometimes mutually inspiring relationship between fashion and religion. Fashion’s engagement with Catholicism belongs to a lineage rooted in artistic tradition and continues the ever-evolving relationship between art and religion,” he said. “It is a rare and exciting opportunity that we hope will engage a diverse and vast audience – Catholic and non-Catholic.” (Catholic News Service). What Can You See at the Met’s “Heavenly Bodies” Catholic Fashion Exhibit? After years of meetings and eight trips to Rome, the “Heavenly Bodies” Catholic fashion exhibit has become the “biggest exhibit the Costume Institute of the Metropolitan Museum of Art has ever held” according to the New York Times. For the first time ever, the Vatican released the most of its treasures ever contributed to an exhibit, with 40 papal vestments, mitres, tiaras and other sacred objects and accessories from the Sistine Chapel Sacristy, many of which have never been seen outside the Vatican. 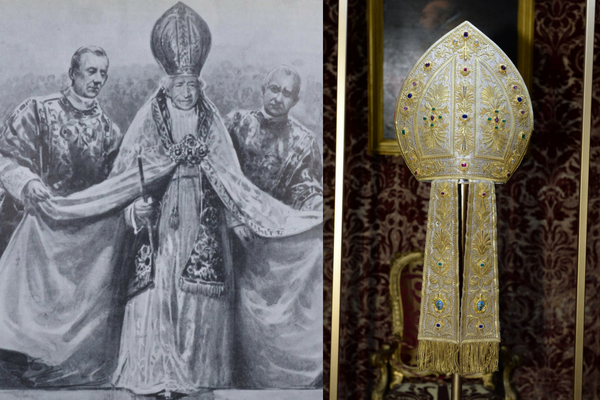 Did we mention that one of the mitres on exhibit once belonged to our namesake, Pope Leo XIII? 1887 – The Mitre of Pope Leo XIII, Courtesy of the Collection of the Office of Liturgical Celebrations of the Supreme Pontiff, Papal Sacristy, Vatican City, The Metropolitan Museum of Art. Mitre Image: Stefano Guindani. The borrowed Vatican items are extravagant and adorned with valuable jewels but focus on the monetary value of the items and you’ll miss the point of the exhibit. Also on exhibit are over 150 ensembles from 55 of the top design houses including Jean-Charles de Castelbajac, Elsa Schiaparelli, Cristobal Balenciega, Coco Chanel, Marc Bohan, Thom Browne, Ann Demeulemeester, Domenico Dolce and Stefano Gabbana, John Galliano, Jean-Paul Gaultier, Christian Lacroix, Jeanne Lanvin, Shaun Leane, Kate and Laura Mulleavy, Raf Simons, Rick Owens, Pierpaolo Piccioli, Maria Grazia Chiuri, Riccardo Tisci, Donatella and Gianni Versace and Yves Saint Laurent. Dismissing critics of the public setting for religiously sacred items, he mentioned Jesus. Jesus was commonly with many types of people including prostitutes, poor and wealthy people, religious and non-religious alike. He said, “it’s in the DNA of Christianity to reach out to all aspects of society while still retaining its own identity.” (cruxnow.com) It is a positive thing for Christianity to be present everywhere. The Met Exhibit and Gala organizers demonstrated thoughtfulness and care during planning and execution. From the presentation of sacred items to the promotion of the exhibit and Met Gala they displayed respect. “Based on my experience, [the organizers] were really, really sensitive,” said Jesuit Father James Martin, editor-at-large of America magazine, and also keynote speaker at our Pope Leo XIII 2017 Gala. To show reverence for the sacredness of Vatican artifacts, they are in a different location separate from Catholic inspirational fashion pieces. Holy vestments are in the basement galleries. Grand secular displays inspired by Catholic hierarchy and ceremony are upstairs in the medieval and Byzantine wing. 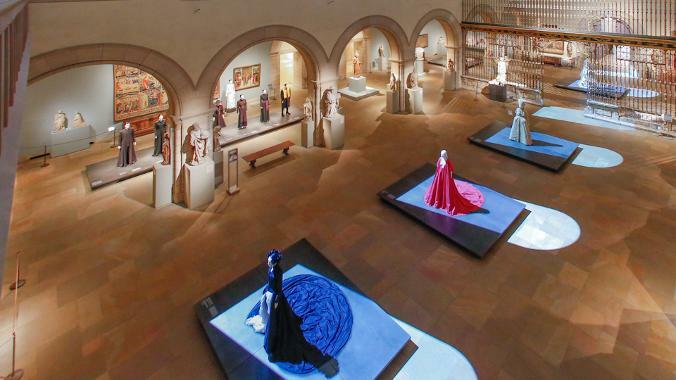 The most contemplative and strongest display, the gowns evoking orders and sacraments, are at the Met Cloisters. How Did the “Heavenly Bodies” Catholic Fashion Exhibit Come to Fruition? It’s not common for the Vatican / Sistine Chapel Sacristy to loan such treasures out for travel to other countries. Many meetings were held between the Met’s head curator at the Costume Institute Andrew Bolton, Anna Wintour, Donatella Versace and Vatican representatives. Vatican representative include prefect of the papal household, Archbishop Georg Gänswein, Arnold Nesselrath, a Vatican Museum curator, and Barbara Jatta, Director of the Vatican Museum, Msgr. Guido Marini, the papal master of liturgical celebrations and the keeper of the Sacristy. Read more about those involved in the New York Times article, “How the Met Got The Vaticans Vestments”). Bolton says, “The loan was negotiated over a period of two years. It required eight trips to the Vatican” (cruxnow.com). All agreed on the great value of the exhibit to present Catholicism front and center in an artful way. We are excited and thankful that organizers were able to pull off such a feat. Bringing the world of the Vatican to NYC, we can view Catholic pieces of history. Are you traveling to New York City? We think you may like to see this amazing Catholic fashion exhibit. While you’re there, we hope you’ll stay with us at The Leo House during your visit.